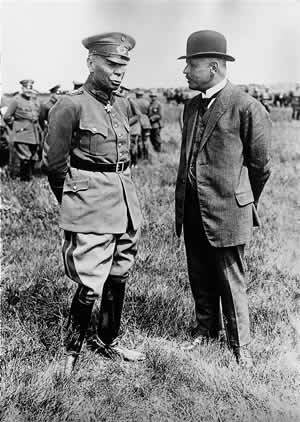 Infantry General Hans von Seeckt (left) was the commander in chief of the German Army from 1920 to 1926. As such he played a pivotal role in shaping the evolution of the interwar German military. Confronted with the reduction of German military capabilities imposed by the draconian Versailles settlement of 1919, Seeckt utilized his experience of mobile warfare on the Eastern Front during World War I to pursue his belief that an aggressive defense conducted by mobile forces could defeat a numerically and materially superior enemy. It was Seeckt, therefore, who initially pushed motorization in the interwar German Army as he sought to inculcate offensive spirit in German troops. The Treaty of Versailles allowed Germany to retain three cavalry divisions, which the Western powers viewed as an anachronism useful only for internal policing duties. Yet Seeckt modernized the German cavalry, adding motor transport and firepower and transformed it into a mobile, offensive, semimotorized, combined-arms force for deep-penetration operations. Under Seeckt’s guidance, the cavalry therefore became the interwar army’s “fire brigade,” designed to rush from one battlefield crisis to another. The mobility and fast-paced offensive orientation that both Seeckt and - inadvertently - the Versailles settlement instilled in the interwar German Army played an important role in Germany’s dramatic Blitzkrieg victories during the early years of World War II.